For this week's episode of my podcast The Corner Radio I'm chopping it up with my peoples Nick and Yaw about their top 5 MC's. But this go round we're looking at it from 3 different perspectives. 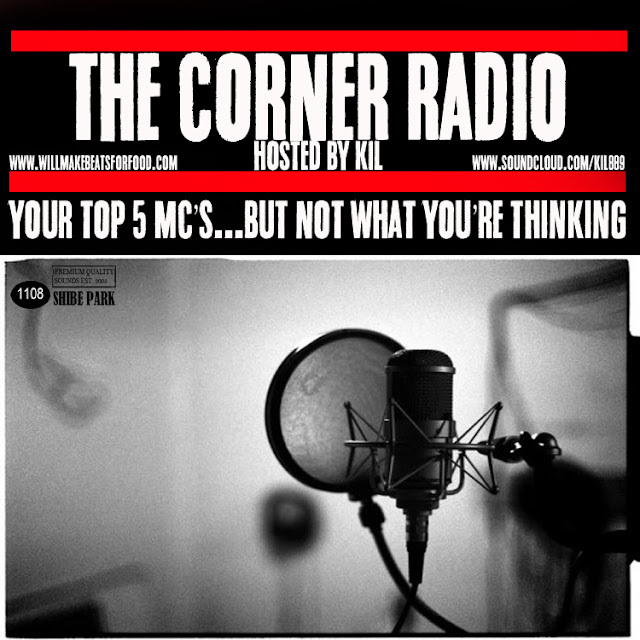 Since Yaw is a MC, I'm asking him the top 5 MC's who've influenced the way he rhymes. With Nick, I'm asking him his top 5 favorite MC's and with me, I'm talking about the top 5 MC's I'd want to make beats for. We also chop it up about how some of your favorite MC's rhymes don't actually rhyme, why Sean P & Ghostface got a lot in common, how Slick Rick's name would be mentioned more if he didn't get locked up, how if you're a MC and you're blessed to get Alchemist to produce your entire project why you have to put it out AFTER your album drops and not before, how the industry waters down a lot of MC's once they get a deal, why me & Yaw's homeboy are on the same page when it comes to Royce's quotables, would Kanye's career have taken off if he was never in that car crash & did "Through The Wire", why Iverson and Marbury have always been synonymous to BIG and Jay to me and did Jay Z really sabotage the careers of some of the artists who were signed to the Roc. ANOTHER dope ep ya'll!